Here's a sneak peak at my current project..... which should develop into a Christmas stocking for my newest nephew by the end of the week! I've previously made them for both his siblings so can't have Tully missing out. 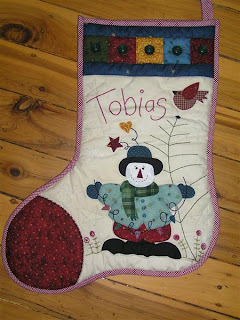 This is the one I made for Tobias a couple of years ago ..... unfortunately, I don't have a piccy of Hannah's! I'm using Hooley Dooley Artworks pattern "Santa's Christmas Stockings"